Announcement FREE Domestic USPS Shipping on ALL orders! FREE Domestic USPS Shipping on ALL orders! Simply gorgeous. And the box! Item was exactly as pictured and described in the listing. It was very nicely packaged in a jewelry box, with a note tucked in describing its origin. It arrived on time, as promised by the seller. I would purchase from this shop again. Father's Day. Best thing you ever did. 1) NO ONE comes close to our vintage collection for sheer fabulousness. No one, period. We acquire all or links one pair at a time. That's right. We have to LOVE each and every pair as if they were our own, and when we sell one, it literally hurts, like a child going off to college, or a lover leaving us, or something equally ridiculous but meaningful. Imported Murano glass from Italy. Hand carved jade Buddhas from Hong Kong. Intricate settings that allow a multicolored marble to rotate freely and magically change color. Real working roulette wheels. Intaglio roman soldiers encased in gem-cut lucite. Hand made links so intricate that if anyone today even attempted to re-create the dies, molds, stones, settings or variety of these vintage beauties from the heyday of men's style, they would have to charge 300 to 500 dollars a pair. And they wouldn't be antiques. I could go on, but you get the picture. Next time you're at that flamingly boring business meeting, (or dressy party, wedding, Oscar night, whatever) lean over to the person next to you, lift your jacket sleeve, and whisper "Swank genuine hand-etched mother-of-pearl elephants from India...huh?...huh?" 4) Start your own legacy. We all know your grandfather and father owned a pair of swank or vintage cufflinks, and maybe you still have them. What about the pair you own that you will hand down to your children or grandchildren? Most of our links are already at least 50 years old, and incredibly preserved. 5) What's a cooler gift to the well-dressed french-cuff wearer? Nothing, in our humble opinion. When you give a CDLC Pedigreed Collection pair, they come with a certificate dating them along with a miniature of the original ad with the style and description on the certificate, so you know exactly what you're getting. Let's face it— it's nice to know you have an original. They are classic and intricate. They are your age and older. They are literally wearable antiques. You look fabulous wearing them. You feel an extra somethin'-somethin' zazzy-zow wearing them. Stand out in the crowd...join the CDLC club. Since most of these items are 50/60+ years old, they understandably do not come with any warranty. Items such as watch cufflinks or any other "mechanical" aspects must be treated with the care and respect for their age—they are NOT new items. Because most of these items are vintage and valued on their condition, we only accept exchanges, PROVIDING THE ORIGINALLY PURCHASED CUFFLINKS ARE IN EXACTLY THE SAME CONDITION AS THEY WERE SHIPPED IN. Any scratches, nicks or damage will incur either a partial or full price of the item fee, ESPECIALLY if they have been in the purchasers possession for more than one month, with the exception of the following items: Watch cufflinks, lighter cufflinks, harmonica cufflinks, or any other mechanical cufflinks—these are tested for mechanical workmanship before being shipped to the buyer, and are purchased at the buyers risk. They are NOT returnable or exchangeable. Buyer is responsible for shipping the cufflinks back to Creme de la Cuff. Once the cufflinks have been inspected, we will notify the customer, and they will be able to either switch out their cufflinks for a pair of equal value or greater. If the selection is of greater value they must pay for the difference in price. We ship all orders FREE via USPS regular mail. We sell vintage cufflinks. We do not sell new cufflinks. None of our cufflinks are new, nor should be expected ever to arrive in “new” condition—even though as you can see in the pictures the majority of our cufflinks are in just that condition. Most of our cufflinks are 50-60 years old, so they have to be considered either lightly worn before, or aged naturally by the elements or conditions in which they were stored, in the case of "new" old stock. 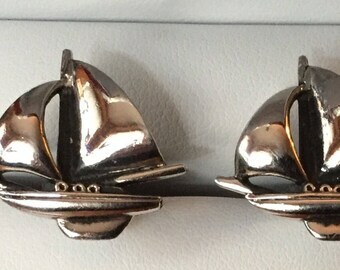 Even "new" old stock cufflinks will sometimes have small customary blemishes of time on them. Some blemishes are from excess humidity or weather conditions--some unsold stock was stored in basements or warehouses—not exactly under "priceless document" conditions, if you receive our meaning. We strive to choose those pairs that are pristine. We do not list or categorize each pair of our cufflinks condition, which is why we list large PHOTOS of every pair and set, without any smoke and mirrors, and leave the interpretation to our prospective buyers/connoisseurs. Simply put, what you see is what you get. We want you to be happy and matched up with your perfect links. You'll know it when you see it. So how do we determine valuation? In a way, we consider some of the same elements that are used in numismatics (coin collecting) except for a few important areas. Each set, while mass-produced is unique, unlike lets say Lincoln pennies, which are all standardized, and easy to rate. Unlike actual currency however, which is not thrown away after wear, many of the fabulous designs of yesteryear have vanished, or are only found in dilapidated condition. We consider the rarity of each pair—how long it took us to acquire them, how many we've seen in years of collecting and acquiring, what condition they are in, as well as consider the actual elements of the links themselves: Do they feature a semi-precious stone? Precious metal? Hand carved? Were some elements imported from another country? Was the edition or collection limited to only a few years? We consider all of these factors, then come to the most important aspect about valuation: How great we think they are. We believe value (and beauty) is in the eye and opinion of the prospective buyer as well—and we trust you to want the ones you love.